Project Overview: Children went to a local roller rink for a day of skating, laser tag, rock wall climbing and navigating an inflatable obstacle course. Rationale: A variety of activities at the roller rink provide physical exercise and concept development opportunities and build confidence. Expanded Core Curriculum Areas Addressed: Recreation and Leisure Skills, Social Interaction Skills, Orientation & Mobility, Independent Living Skills, Self Determination Skills. Description: Children visited a local Roller Rink, which offered a variety of activities including: roller skating, rock wall, laser tag, inflatable obstacle course, and indoor playground. 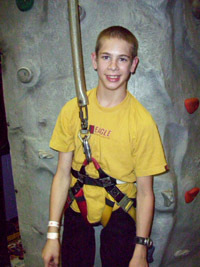 The children could choose to participate in any of the available activities. For lunch, children ordered food from the snack bar using meal tickets provided by the facility. 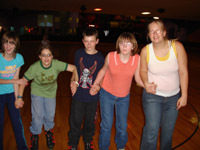 The children varied in their confidence and skill on roller skates and were paired accordingly with sighted chaperones. Some children who’d never roller skated before preferred to stay in the carpeted areas, while others skated independently on the rink itself with only verbal cues to tell them when they were nearing the corner. Children who chose to climb the rock wall used hands and feet to feel for each hold. This activity was particularly strenuous for some of the children, but they continued to try until they reached the top. 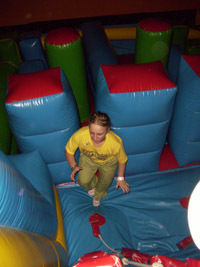 The inflatable obstacle course was a favorite for many of the children. The course contains two runs, so that two individuals can race each other through. Initially a sighted guide went through the course with each student to orient them to the layout. Once the student was able to go through the course independently, with the guide merely observing, they were freed to enjoy the course on their own the rest of the day. The indoor playground was an option for those younger children who were not big enough to participate in the inflatable obstacle course. This playground includes a variety of activities such as climbing areas, slides, swings, tunnels, and a ball crawl. In the laser tag arena, children relied on sighted guides as well as their auditory sense to locate their opponents. Result: This activity provides children with a variety of benefits. Engaging in such challenging physical activities in a safely monitored environment is a great way to build confidence and physical stamina. Their faces light up with pride and accomplishment when they finally make it to the top of the rock wall and press the buzzer. I’ve also seen marked improvement in the children’s roller skating skill and confidence as they participate in this activity over time. The children also enjoyed socializing with their peers throughout this activity. Locate a roller rink to host your event. Find out what other activities they offer. Inquire about a group rate. Make arrangements for lunch. Do they have a snack bar? If not, can you bring food in? Is there an area to eat? Make sure you have enough volunteers who are competent skaters to assist students on the rink.